ScanTailor_multi_core speeds up ScanTailor Enhanced image processing by using multiple CPU cores. Note: this is old software. Newer versions of ScanTailor such as Scan Tailor Advanced and Scan Tailor Experimental have built in support for multi core processing. Processes step 6 in ScanTailor Enhanced many times faster on computers with multiple CPU cores. Note: Mode (B) saves a temp project file to the ScanTailor_multi_core folder. If processing fails retry with that .ScanTailor file. 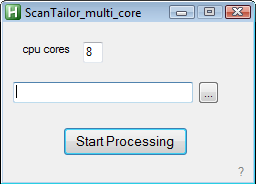 - Download and unzip scantailor_multi_core.